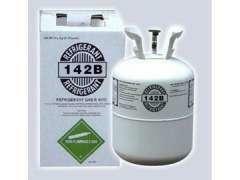 HCFC-142b is colorless gas with slightly aromatous smell at room temperature. It becomes colorless and transparent liquid under the pressure created by itself. It dissolves in oil easily, but not in water. Its main applications cover refrigerating systems at high temperature, on-off thermostat and intermediate in the aviation properllant. In can also be used in chemical industry.